Recently I signed up to be one of the volunteer painters for a charity project called Kobolds for Kids as recommended by Adam, a buddy that I met at Adepticon 2013. 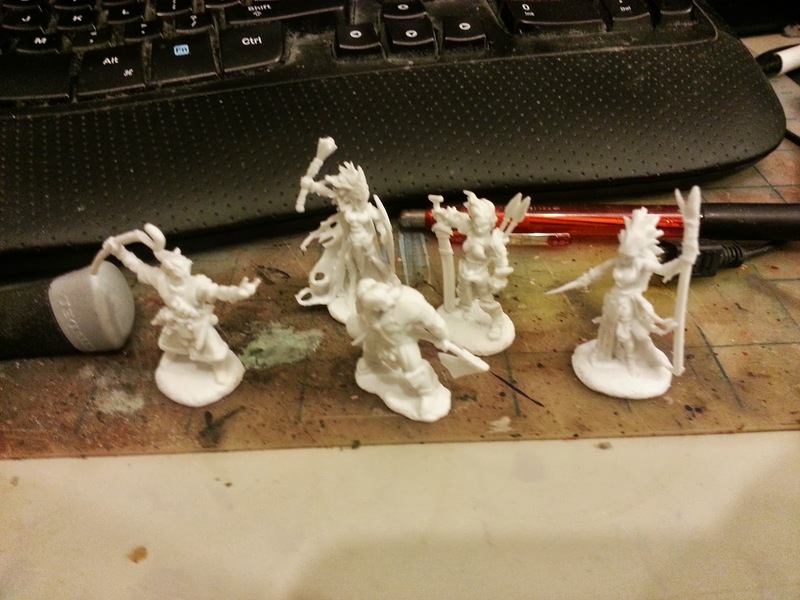 The project started out small and simple with their group pitching in to the Reaper Miniatures Bones Project on Kickstarter. Then they got into a conversation on how difficult to paint all 241 miniatures that you get from that project. So they decided to create a little painting competitions to encourage themselves to actually complete the project. Someone, however, suggested a better idea: “Instead of competing, what if we took the painted lot and auctioned it off for charity?” To add icing to the cake, they contacted Reaper Miniatures and they decided to donate a whole set of those 241 miniatures (from the Vampire level pledge). Now sh*t just got real! The Kobolds for Kids team agreed that there are two charity projects that were important to them and that are where they will put their efforts in. The first project is the Boston Children’s Hospital. They have provided a life-saving treatment to more than one of the crew’s children. And the second project is a personal project for one of their gaming friend’s wife who was diagnosed with stage IV triple negative metastatic breast cancer. “Why are you doing this Mars? I don’t live in Boston, and I don’t know these people personally but I know they would need as much help as they can get. Some of you guys might not know this but I have watched someone who is dear to me battle cancer and it was not pretty. A lot of “what if we could…” statements and questions would run through my brain during those times. It would put me at ease to know that if I could just give back to the community with what I do best to help these organization and people, and hope that it would get rid of their “what if we could…” questions . After a month long break from the blog, I’m finally back writing! Not only that I haven’t been writing, I also haven’t been painting for about the same time. I have been working on finishing up Mini Wargaming DVD tutorial. So look forward to see my DVD tutorial being posted up there. Wife caught some kind of cough that wouldn’t stop for 2 weeks. She has gotten better and should make full recovery by this week. I have been tidying up the work area with a new shelf so now my computer and my paint station is all in 1 area. And lastly, I have been co-producing a live show on YouTube called Sunshine & Moonbeam: Journey to Crystal Brush 2014. I want to take a moment to describe how this live show means to me, but it wouldn't feel right without describing how the idea came up in the first place. As some of you might know, the WGC community has nightly Google Hangout sessions where people would work on their projects or do whatever they want. I, myself, got into the hangout circle roughly about a year ago when I started the Voices of Mars channel. The circle grows bigger and bigger and I met a couple of people: Myst1x and Maxxpayne390. I’ve always wanted to do a tutorial series where I would teach new hobbyist or people who wanted to get into the hobby and don’t know where to start. The idea would start from “Where to Get Your Miniatures From” all the way to the basic way of painting your miniatures. Now after a lot of conversation between me and the other 2 guys about how they wanted to go to Adepticon to enter the Crystal Brush competition, Myst1x (a 6-month old new hobbyist) challenged Maxxpayne390 to see who can win (more) at Crystal Brush 2014. At that point I didn’t pay much attention and just laugh it off. After getting to know Myst1x a bit more, we usually get into a lot of banter and one morning I greeted him with “Morning Sunshine!” and he replied with “Morning Moonbeam”. My brain clicked... imagine a spinning room… Tutorial series for new hobbyist, a journey to Crystal Brush, perfect Cinderella story, Sunshine & Moonbeam. BOOOOOOM! Sunshine & Moonbeam: Journey to Crystal Brush 2014 was born! I then shoot out the idea to Myst1x, who then agreed to co-host the show and be my guinea pig despite his nerd attitude (read: social anxiety), who then discussed it with Maxxpayne390 and the rest of the hangout circle. Everyone seems to support the whole idea and plans were being written out as fast as you can prime a model. I also had the idea of inviting different guests each week to help me “teach” Myst1x the basics of the hobby, but I didn’t want to ask help from people that are already well known in the field. I wanted to focus on the people who I spoke/interact with that have talents, but are not widely known in the community. I thought it would be a good chance for them to break out of their shell and introduce them to the WGC community as contributing members. I didn’t want them to be THE expert of the topics that are being introduced each episode. I wanted them to be someone that experienced the problems and found solutions, and sometimes they would actually learn new things by being in the show and interact with audience. All of the guests invited were more than willing to come and spend their Saturday afternoon with us for roughly about an hour. Some were even more excited than I sounded when I invited them which then fuel my own excitement (vicious cycle of excitement). Now with all that excitement, I thought “why stop there?” Crystal Brush is 35+ weeks away and with those 10 episodes could only fill out 10 weeks. I thought we needed something bigger, and the show did get bigger. As fillers before Season 2 starts, we have invited more people to come to the show and help teach. This time it won’t be only Myst1x that will be learning, but I will sit down with some questions on my own. If you need time to pick your jaw off of the floor after reading that guest list, take as much time as needed. As you can see, this project has become bigger than I imagined and I don’t know how it can get any bigger than this! It doesn’t take a genius to figure out how I feel about this project. I’m very excited not only because I get to learn from some of the best painters in the world, I also get to share this with the audience over on YouTube. I hope you guys can watch the show (live or reruns) and stay tuned for more updates!